It is interesting to note that Tate Britain has rearranged its collection into chronological order. The aim is to permit a more ‘neutral’ viewing . I admire this decision: curation can so often be biased, and an objective method may be the best way to invite new observations of old masters. Last year, I visited the Fashion Museum in Bath. I was frustrated by the fact that the dresses were not arranged in chronological order. I saw no explanation of the curator’s intentions; the clothes seemed to be arranged into aesthetic categories (colour, for example). The problem with this is that it is not reflective of one of the fundamentals of fashion. Fashion is progressive – it moves forever forwards. The fashion cycle may draw on the past, but at its core is chronological progression. Fashion evolves: hems and waists creep up and down, colours fade in and out. It is only possible to trace this evolution if historical collections are displayed chronologically. I assume that a central reason for displaying historical garments (as opposed to recent fashions) is to demonstrate how clothes have changed over the years. Change, in this case, is the difference between garments created before an after one another. This difference can be most easily recognised and understood if we are aware of where artefacts lie in a temporal sequence. Many fundamental observations about fashion rely on chronological observation. Fashion is identified as ‘an evolutionary outgrowth and elaboration of the previous fashion'. Fashion styles are distinct from ‘fads’ because they are not independent anomalies; instead they follow an evolutionary cycle. If garments are not displayed in the context of progression, we may only appreciate each garment on its own individual merits, not its position in social, cultural or political history. Each dress becomes a mere curiosity, removed from historical context. 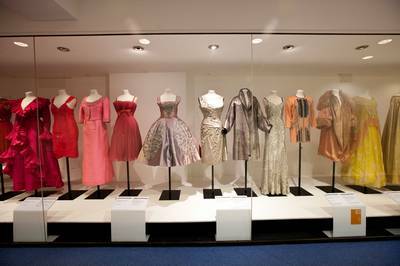 If fashion museum curators do not arrange garments chronologically, it is difficult to appreciate them as ‘fashion’. ‘Fashion’ is, by definition, temporal. If historical costume is removed from chronological context, it limits our understanding of the significance of garments on display. Despite my criticism, the Fashion Museum is well worth a visit. Miller, Christopher M., McIntyre, Shelby H., and Mantrala, Murali K. (1993) ‘Toward Formalizing Fashion Theory’, Journal of Marketing Research 30 (2), (May, 1993), 145. Star Trek: Into Darkness uniforms. Uhura’s uniform retains the 1960s silhouette. J. J. Abrams’ Star-Trek Into Darkness, and the forthcoming After Earth (Shyamalan, 2013), are reminders of how film and TV so often depicts future fashion as skimpy or skin-tight. The uniforms in Abram’s recent Star Trek revival have progressed from previous versions, but retain the hallmarks of the originals. The men’s uniforms have a mesh outer layer, reminiscent of moisture-wicking sportswear. The female uniforms are more precise replicas of the originals, with miniskirts and knee-high boots. In After Earth, stranded father and son are costumed in something reminiscent of an armoured wetsuit. These films are following a tradition established by films such as Logan’s Run (1976), Buck Rogers (1979-1981), and Tron (1982), in which costume left little to the imagination. Historically, fashion has tended towards being increasingly revealing. It has become progressively more acceptable to reveal the body, in ever-more form fitting garments and exposure of skin. It therefore seems likely that sci-fi costumes like these reflect the logical progression of fashion. In science-fiction, the costume designers can only speculate as to what the fashions of the future may be. In hindsight, many of these prove inaccurate. The ‘futuristic’ visions of some 1960s and 70s sci-fi now have a retro feel. 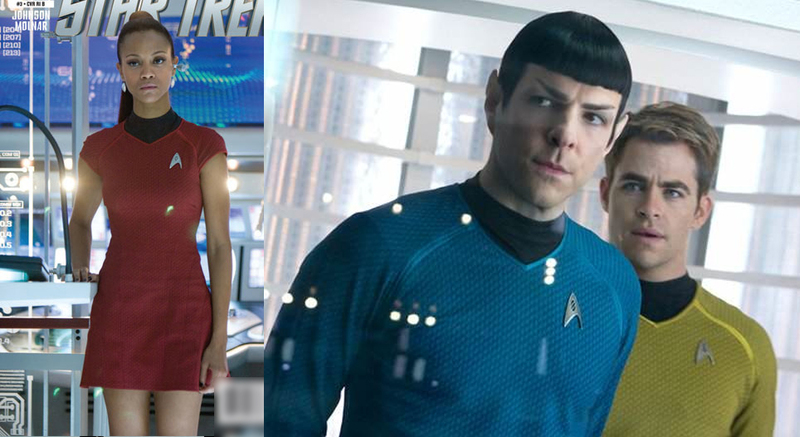 The mini-dresses that have survived Star Trek reboots are a homage to the 1960s – the decade of the original series. Costumes like those worn by Barbarella (1969) featured fabrics that were perceived as futuristic at the time, including metallic fibres and plastics. When these materials were incorporated into fashion by designers including Mary Quant and Paco Rabanne, they represented the height of fabric technology. Perhaps as a result of this enthusiastic adoption by the fashion world, they have become more closely associated with the 1960s and the Space-race aesthetic than with the future. Barbarella wore costume that reflected the 1960’s Space-age aesthetic. Science-fiction films tend to fall into two categories. First, there are those that imagine the progression of society towards a brighter, technologically-enabled future. Second, there are dystopian societies that have regressed to resemble a historical era. Sci-fi costume can be divided into the same two categories. It imagines a possible future that has progressed forward, following established rules of fashion evolution (as in Star Trek), or a vision that resembles a Western or Victorian period drama (as in Joss Whedon’s Serenity, 2005). Both of these approaches are fair. Fashion is cyclical. It relies on revival and bricolage. It is therefore quite likely that, regardless of how technologically advanced we become, our clothes will directly appropriate from what has come before. In order to move forward, fashion reframes the past. Historical references are also useful in connoting social, political and cultural aspects of these imagined futures. The Nazi-esque uniforms of Starship Troopers (1997), for example, help to establish the sense of a military dictatorship. 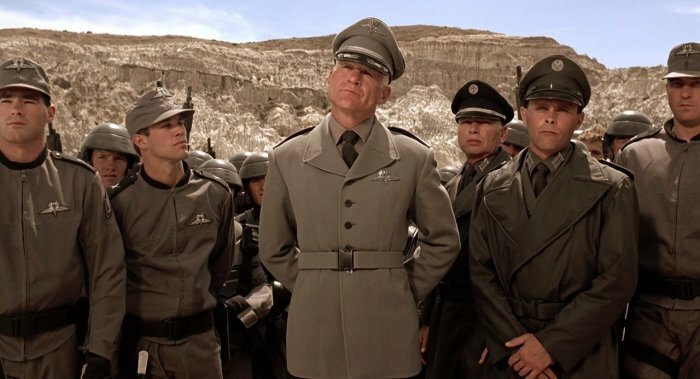 Nazi-inspired military uniforms in Starship Troopers. Though fashion tends to be cyclical, new technology does create exceptions. It allows clothes that have never existed before. Some of the most influential trends of the last hundred years of fashion have been inspired by new science. Access to new fabrics, such as PVC, allowed Mary Quant to rebel against tradition. Arguably, it was social change (sexual liberation) that led to the adoption of skin-tight jeans and leggings, but this could never have happened without the introduction of lycra. Similarly, no pre-existing moments in the fashion cycle would have enabled us to predict CuteCircuit’s ‘Twitter Dress’. Science is also transforming the way we create clothes. Clothes have historically been produced by sewing flat shapes of fabric together, thereby transforming multiple flat shapes into a single three-dimensional shape. New technologies are beginning to make sewing obsolete. Issey Miyake has established a research institute in Toyko with the aim of exploring new possibilities in fabric and garment creation. This research has yielded new bonding methods that may change our approach to garment manufacture. As in A-POC (a complete outfit that is manufactured at once, from a tube of fabric), the acts of weaving fabric and sewing pieces together are no longer separate processes. The weaving of the fabric and the bonding of the layers can be a single automatic process. There is no sewing, and therefore no seams. A collaboration between Imperial College London and the Royal College of Art resulted in the invention of Fabrican, a spray-on-fabric. Fabrican canisters contain wet fibres which may be sprayed directly onto the surface of the body (see video below). As the fibres dry, they bond, forming a single piece of flexible shaped fabric. Spray-on-fabric has the potential to revolutionise the fashion industry. As it is sprayed directly onto the body, it removes the issue of sizing from the dressmaking process. It also changes the way that garments may be repaired. In order to fix a rip or tear, more fabric may be sprayed to invisibly seal the hole. Fabrican is like a second skin: tight-fitting and seamless. This gives credence to the theory that skin-tight garments may become more common, and provides further evidence that future fashion is likely to be seam-free. As in the reinvented Man of Steel (2013) costume, and wetsuits in Star Trek Into Darkness, clothes may be moulded to fit our bodies perfectly. 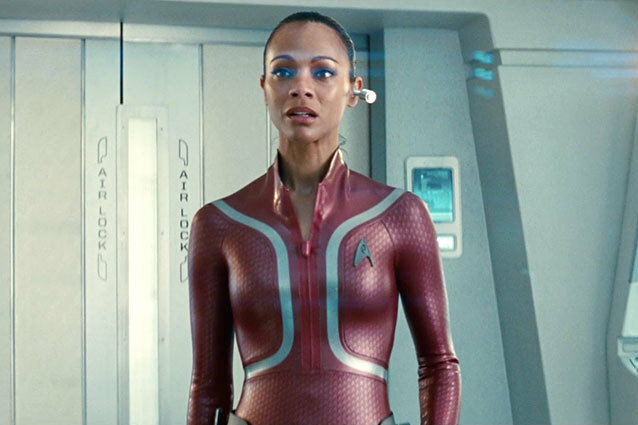 Uhura’s wetsuit in Star Trek Into Darkness may closely resemble the future of clothing, moulded and skin-tight. Another factor to consider is that many of these costumes are uniforms. Uniform tends to fall outside of the usual fashion cycle. It is fixed, rather than modal. Uniforms tend to remain largely unchanged for many decades, and are therefore likely to be at least partly historical in design. It is possible that the uniforms of the future would be very similar to those worn today, and would follow the same signifying systems for rank and situation. If we want predictions of fashion’s future, we should ignore the Star Fleet uniforms and explore the clothes worn by the extras in the background. In the bar scenes and on the streets of future London, we see signs of otherness that truly sets the Star Trek world apart from our own. Here we see the exoticism of alien influence, and the hybrid styles that arise within the fashion cycle. Scotty sits in a bar in Star Trek Into Darkness. 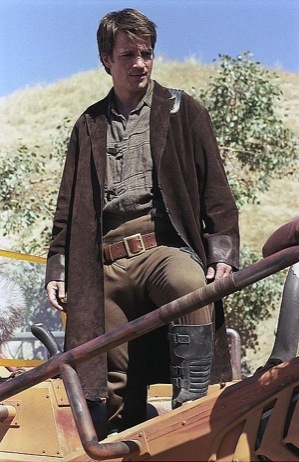 The extras behind him all wear 1960s-inspired fashion. Seymour, Sabine (2008) Fashionable Technology, New York: Springer Wien, 2008, 86. Except when structures are attached to the body first. Barnard, Malcolm, Fashion as Communication, London: Routledge, 1996, 12.